There are a number of vacation oriented hotels located in Rhode Island and conveniently close to the fishing charter boat Adventure and Aces Wild. So if you planning a vacation in RI don't overlook South County, there are many other attractions in this area of Rhode Island. If you are coming from outside of RI it may make a lot of sense to stay at a local hotel the day before your fishing trip. If you pick a weekend you could make a mini vacation out of it and stay the whole weekend, eat at Jim's Dock Restaurant after your fishing charter, then check out some of the local attractions in South County the following day. There are quite a few Rhode Island area motels and cottages to choose from. We have provided a list of those closest to our fishing charter below, with contact information. We recommend Wakamo Park as it is less than a mile from the marina and is therefore most conveniently placed. Rhode Island South Shore Bass. Block Island North Rip Bass. East Matunuck This is closest to Jim's Dock where the charter boats are located. The park has small cottages you can rent during the summer for $120/night or $765 per week. It is only 1 mile from Jim's Dock and Restaurant where the Adventure is located. Nearby is East Matunuck State Beach about 1/4 of a mile from the park. Open April 15 to October 15. 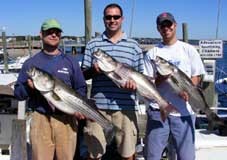 So don't hesitate to enjoy your adventure vacation here in the Ocean state of Rhode Island, we can hook you up with a great family recreational day of Fishing on a great charter boat. Copyright 2004-2011 Adventure Block Island Charter Boats. All rights reserved.